100% cotton Gildan Dark Chocolate t shirt with a western kick! 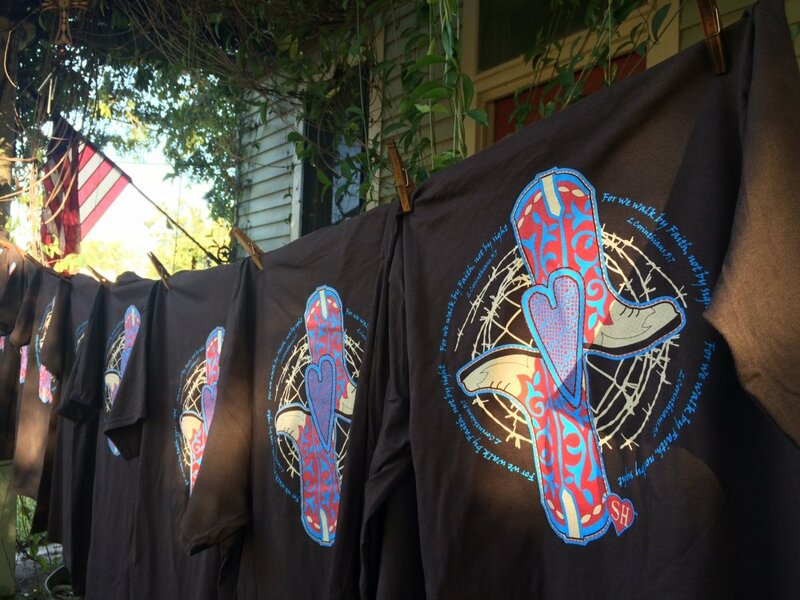 This is the thirteenth t shirt in the Swinging Hearts line and is calling all of you that love boots. This shirt has two boots placed to resemble a cross. The boots are a tan, red, and blue colorway, with a scrolling pattern on the top. There is a small line of stitches that go around the boot. In the background are circles of barbwire. There is the heart in the center of the boot cross that is red and blue. Around the design is the verse, "For we walk by faith, not by sight." 2 Corinthians 5:7. The same cross is on the front of the t shirt. Order yours today and get one for a friend.